During a kickoff event at Zephaniah Farm Vineyard on Sunday, the Loudoun County Democratic Committee introduced its candidates so far for the 2019 local elections. Every local elected official except the Clerk of the Circuit Court Gary Clemens will face election in November, and Democrats hope to extend their success over the past two years in flipping Republican seats in this round of local elections. Currently, Republicans hold all of those seats except for three seats on the Board of Supervisors and three on the School Board, although School Board elections are nominally nonpartisan. In 2015, some of those elected officials ran unopposed. Commissioner of the Revenue Robert S. Wertz Jr., and School Board members Eric Hornberger (Ashburn), Jill Turgeon (Blue Ridge) and Brenda Sheridan (Sterling) faced no opponents. In a statement introducing the slate, Committee Chairman Alfonso Nevarez tied the local election to the national political landscape. In the past two elections, Loudoun flipped most of its state representation from red to blue and strongly supported Congressional Democrats Tim Kaine and Jennifer Wexton, but much of western Loudoun remains strongly red. This November, incumbent U.S. Rep. Barbara Comstock (R-VA-10) edged out Wexton in the Catoctin District, and Comstock and Republican Senate candidate Corey Stewart recorded wins in several western Loudoun precincts, including in Lovettsville, Waterford, Hillsboro, Round Hill and Purcellville. On the Board of Supervisors, Democrats hope to re-elect County Chairwoman Phyllis J. Randall (D-At Large) and supervisors Koran T. Saines (D-Sterling) and Kristen C. Umstattd (D-Leesburg). They also hope to elect nonprofit executive Mike Turner in the Ashburn District; marketing officer Juli Briskman in the Algonkian District; small farmer and business owner Tia Walbridge in the Blue Ridge District; and special education teacher Sylvia Glass in the Broad Run District. Those seats are currently held by Supervisors Suzanne M. Volpe (R-Algonkian), Tony R. Buffington (R-Blue Ridge), and Ron A. Meyer Jr. (R-Broad Run). DC city government official Forest Hayes has also announced he will run for the Catoctin District on the Board of Supervisors. That seat is held by Supervisor Geary M. Higgins (R-Catoctin). On the School Board, members who were endorsed by the Democratic committee in 2015 include Tom Marshall (Leesburg), Joy Maloney (Broad Run) and Brenda Sheridan (Sterling). 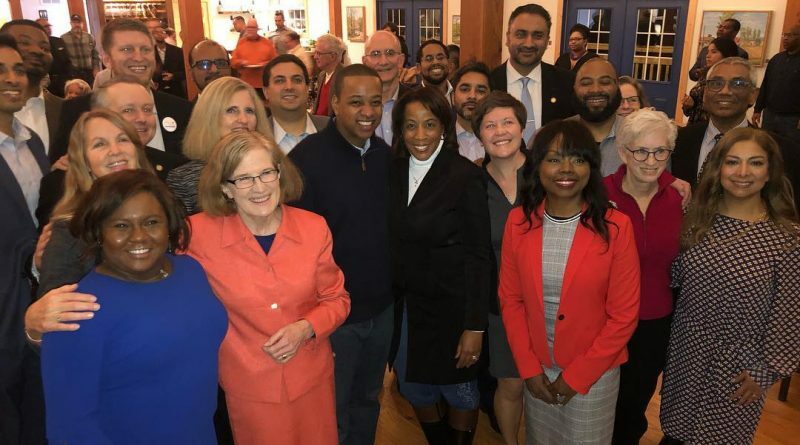 This year, Democratic candidates also include attorney Atoosa Reaser in the Algonkian District, government IT contractor Ian Serotkin in the Blue Ridge District, adult educator and consultant Ayshah Price in the Dulles District, and attorney Ibrahim Moiz in the Sterling District. Those seats are currently held by Sheridan, Chairman Jeff Morse (Dulles), Debbie Rose (Algonkian), and Jill Turgeon (Blue Ridge). IT professional Sri Amudhanar will run for commissioner of the revenue, and attorney Buta Biberaj will run for commonwealth’s attorney. Barring special elections, Loudouners will have the chance to vote for eight local government representatives in November: A district and at-large member on both the Board of Supervisors and the School Board, and the four countywide constitutional officers up for election. So glad to see this strong group of dedicated community servants. I will sign up to help anyone running to get Volpe out. Also, love that a lawyer is running for School Board in Algonkian. Really, is wagging your middle finger at the President now what the democrats are parading as community service? I have it on good authority that Trump gave her 2 fingers back as he drove away in the Presidential limousine.